His security detail reportedly got so much overtime that many employees reached their yearly salary caps. The Environmental Protection Agency reportedly spent millions on Scott Pruitt's security. 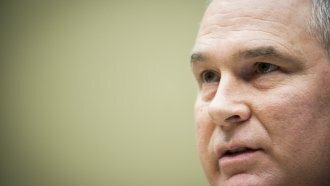 A report from The Associated Press says Pruitt had a full-time security detail and that his employees blew through their overtime so quickly that many hit annual salary caps of about $160,000. Some EPA agents were reportedly taken out of the field in order to provide security. The new report adds to a growing list of ethics scandals faced by Pruitt during his tenure as head of the EPA. In August, the EPA's inspector general began investigating a number of expensive, taxpayer-funded trips Pruitt took. That investigation expanded earlier this year, and in March it was revealed Pruitt and his daughter rented a D.C. apartment from the family of an energy lobbyist. And speaking of Pruitt's security, the EPA director has also installed a soundproof phone booth in his office that cost close to $43,000, had biometric locks put in his office that cost over $5,000 and had his office swept for concealed listening devices for $3,000. Pressure has been mounting for President Donald Trump to do something about Pruitt. White House Chief of Staff John Kelly reportedly told Trump last week to let Pruitt go. And 64 House Democrats are calling for Trump to fire the EPA chief. But the president has said he still has confidence in Pruitt — though White House press secretary Sarah Sanders told reporters "the president is not" OK with the most recent reported ethics violations.